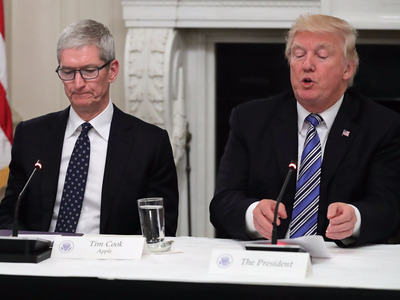 GettyApple CEO Tim Cook with Donald Trump. Tim Cook donated $US236,100 to the Hillary Victory Fund fundraising committee in 2016, the largest individual contribution by an Apple employee. Clinton received a total of $US1.8 million from Apple’s workforce, while a paltry $US6,786 was given to Trump’s 2016 election campaign. Despite trying to stop getting Trump elected, Cook has taken a pragmatic approach to relations with the president since his victory. Apple employees really didn’t want Donald Trump to become president, not least CEO Tim Cook. A detailed analysis of political donations made by Apple staff by non-partisan political data firm GovPredict found that Hillary Clinton was a big beneficiary of donations from Cupertino, California. In total, she received $US1.8 million from Apple’s workforce. Leading the pack was Cook, who made the largest individual contribution by an Apple employee when he donated $US236,100 to the Hillary Victory Fund fundraising committee. He also hosted a fundraiser for Clinton. In contrast, Apple staff only gave $US6,786 to Trump’s 2016 election campaign. 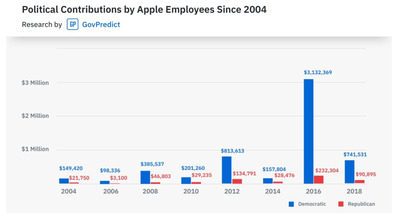 Apple’s donations to Clinton also dwarfed the $US610,805 made by Amazon employees, according to a separate GovPredict analysis. Cook’s donation to Clinton is in contrast to his fairly modest political contributions in the past, which have been fairly evenly spread between the Democrats and Republicans. According to CNBC, Cook has personally given $US10,800 to Republican candidates and joint fundraising committees since 2008, while he handed $US10,400 to committees on the Democratic side over the same period. Cook was also considered as a potential candidate to be Clinton’s vice president, had she clinched the White House. His name was on a list sent by Clinton campaign chair John Podesta in an email, which was released by Wikileaks. Since Trump was elected, Cook has taken a pragmatic approach to relations with the president. They have met on a number of occasions, including holding recent talks over the China trade war. 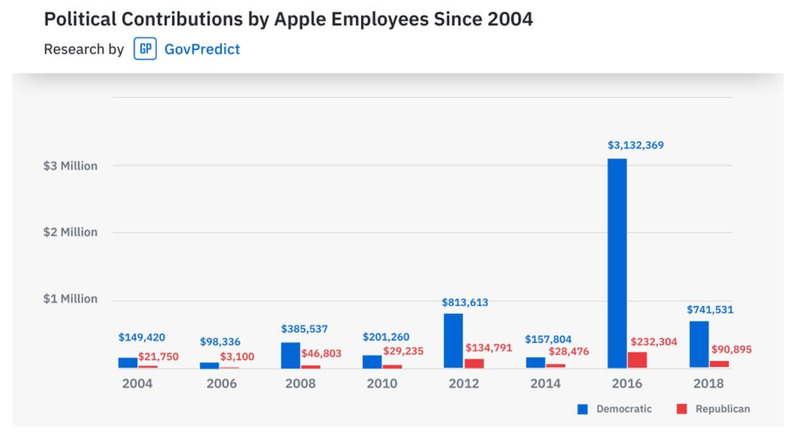 Overall, Apple employees gave more than $US3.1 million to Democratic causes in 2016, compared to the $US232,304 handed to Republican campaigns. In fact, staff have consistently backed the Democrats over the GOP since 2004, according to GovPredict. The Apple research was presented in a blog post by GovPredict CEO Emil Pitkin. Pitkin is a former Harvard graduate and launched GovPredict at the Y Combinator demo day in 2015. The company is also said to have $US120,000 in seed funding from Y Combinator, which has backed startups such as Airbnb, Reddit, and Stripe.